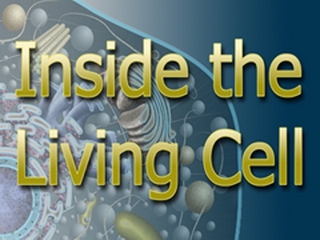 The series can be used as an introduction to our in depth cell biology program, Visualizing Cell Processes. Students learn how cells carry out the fundamental processes of life. The menu structure offers over 30 learning chapters that can be discussed and repeated as needed to assure that everyone is up to speed on the content. 00:03:47Shows how to easily create a "Leeuwenhoek" microscope of the kind used 300 years ago to discover single cells living in pond water, and how Robert Hook coined the term cell, through the examination of a thin slice of cork. 00:02:02Shows that DNA is the molecule that contains the genetic information units called genes. Among other functions, genes spell out the amino acid sequences for specific proteins. In addition to their structural uses, specific proteins act as catalysts that promote all of the reactions that produce life. 00:01:50Electron microscopes, developed in the 1940s, showed that cell organelles such as chloroplasts and mitochondria had elaborate sub-structures related to their biochemical functions. It showed that bacteria had a much simpler make up than nucleated cells. We now refer to bacteria as "prokaryotic cells" and nucleated cells as "eukaryotic cells." 00:03:46Shows that all life is based on carbon with its four bonding sites and how that element enables the generalized structure of carbohydrates, fats, proteins, and nucleic acids (DNA and RNA). This "macromolecules" are broken down into their building block units through digestion. Cells can then use the building blocks to build their own carbohydrates, fats, proteins and DNA. 00:02:06The plasma membrane consists of but two layers of lipid molecules that are in constant motion, shifting and trading places thousands of times a second. In this thin sea of lipids float a variety of proteins that provide channels for larger molecules to enter and leave the cell. 00:01:12Biological membranes are self-sealing, expandable and easily merge with similar membranes. Many processes rely on these physical properties as we see in the daily life of an amoeba. Plants surround their plasma membranes with a tough cell wall made of cellulose. 00:01:40Several different kinds of proteins provide channels through the shifting lipid layers. Some allow large molecules to move from areas of greater concentration to areas of lesser concentration, a process called Facilitated Diffusion. Other transport proteins use energy to pull molecules across the membrane, a process called Active Transport. 00:04:30Endocytosis (cell eating) is of three kinds. Phagocytosis the engulfment of solid particles. Pinocytosis (cell drinking) refers to the intake of molecular soups through tiny pockets in the membrane, and receptor mediated endocytosis, a process in which receptor molecules fish for specific kinds of substances such as hormones, transporting them into the cell. 00:00:56An organism's entire energy budget is spent on the cell level. The kind of energy cells used is chemical bond energy - the shared electrons that hold atoms together in molecules. 00:02:01ATP, the Energy Carrier. Most cell processes use the same energy source, the rechargeable energy carrier -- adenosine triphosphate (ATP), made by coupling a third phosphate group to adenosine diphosphate (ADP). This third phosphate is held on by a high energy chemical bond that can be donated to other chemical reactions, freeing the end phosphate. That leaves ADP, ready to be recharged, a process that takes place in a particular cell organelle -- the mitochondrion. 00:02:25Mitochondria are the powerhouses of the cell. The nucleated cells of animals and plants all contain mitochondria, the tiny bodies where ATP is synthesized from ADP. A mitochondrion has an inner and outer membrane -- a sac within a sac. Folds in the inner sac increase the surface area for chemical reactions that produce ATP. This How Cells Obtain Energy clip illustrates how this process occurs. 00:02:24The role of oxygen in cellular respiration. 00:00:47In How Cells Obtain Energy the photosynthesis clip, we see that in terms of getting energy, the only real difference between plants and animals is that plants make their own fuel molecules, where as we animals, in order to get fuel for our mitochondria, must eat our green benefactors, or eat something that has. 00:01:08Chloroplasts are the cell organelles (found in plant cells and green algae) where photosynthesis takes place. The electron microscope shows that chloroplasts contain stacks of hollow discs called thylakoids, covered by carpets of chlorophyll molecules. Here, light energy is converted into chemical energy -- a process that drives the living world. 00:01:12The chemical reactions of photosynthesis can be divided into two parts: The "light reactions," where water is split into oxygen (given off as a waste product) and hydrogen ions. At the same time, light energy is converted into electron energy by the carpets of chlorophyll molecules. The energized electrons and the hydrogen ions are used in a process that creates ATP and other energy carriers. 00:01:01The "light independent reactions" use these energy carriers to make food molecules (sugars) using atmospheric carbon dioxide as a carbon source. The animated clip shows how the two parts of photosynthesis combine to produce carbohydrates. 00:01:23How Cells Obtain Energy is summarized for quick review in this clip. 00:04:09A few drops of hydrogen peroxide (H2O2) on a small wound demonstrates enzyme action, as the enzyme Catalase, found in all animal tissues, breaks down the H2O2, into water and a torrent of oxygen bubbles. A cube of liver shows an even more dramatic response, until the temperature is raised to 50 degrees C, at which point the enzyme is destroyed and the reaction stops. 00:04:15During the process of DNA replication enzymes break the cross links producing two half-ladders (two single strands of DNA). Under the influence of an enzyme, matching nucleotides from the cell's stock pile are coupled on, creating two identical molecules of DNA. When each of the 46 DNA molecules in a human body cell has undergone this process of DNA Replication, mitosis can begin. 00:03:25Onion roots are fast-growing tissues, and so make a good place to see the stages of mitosis that lead to cell reproduction. Once can see the stained cell nucleus in various stages, and piece the observed stages together into a story that shows how the onion's chromosomes get divided into two identical sets - the complete genetic blueprints for two new onion root cells. Following mitosis, plants, animals and protists each have their own methods of separating into two new daughter cells. 00:03:49Replicating DNA involves matching hundreds of nucleotides per second so it's not surprising that mismatches occasionally occur (about once in ten thousand matches). Were these mistakes to accumulate the genetic blueprint would become muddled and survival would suffer. To cut down on accidental errors, the DNA is scoured by proofreading enzymes that keep the genetic blueprint in remarkably pristine condition.